Description This is the ninth and the most celebrated of the nine Nava Tiruppatis in Tirunelveli district in the belt between Tirunelveli and the coastal shrine of Tiruchendur. Only Nammalwar, who resided at Alwar Tirunagari, has sung of these nine shrines Tiruvaikuntham, Varagunamangai, Pulinkudi, Tolaivillimangalam, Tirukkulandai, Tirukkolur, Tirupperai and Tirukkurugoor collectively referred to as Alwar Navatiruppati. Tolaivillimangalam referred to as Irattai Tirupati, counts as two in the scheme of Nava Tirupatis, but as one of the 108 Divya Desams. Nammalwar honors Tirukkurukoor with a decad of 11 verses. Nammalwar's signature in each of his decads is Kurukoor Sadagopan. This shrine is very closely associated with Nammalwar, who lived his life here. Alwar Tirunagari is also known for Araiyar Sevai, where the Divya Prabanda Pasurams (verses) are recited with expression, music and rhythm as in Srirangam and Srivilliputtur. Deities: The Moolavar here is Aadi Naathan or Aadi Piraan. Taayaars here are Aadi Natha Valli and Kurukoor Valli. There is a shrine to Nammalwar. The tamarind tree, in which he resided (Tiruppulialwar) is the stala vriksham here The name Alwar tirunagari is attributed to Nammalwar's presence. Legend has it that Indra was absolved of his curse here. It is believed that Lakshmana incarnated as the tamarind tree here. Vishnu is believed to have been under a vow of celibacy, when Lakshmi meditated upon him to marry him and therefore Vishnu took her in the form of a garland of flowers (magizha malar maalai). There is another legend that Agasthyar had been blessed by Shiva, that there would be born a saint (Nammalwar) in this area, who would enthrone the language tamil to a status equal to that of sanskrit. The temple: This temple covers an area of 5 acres and has three prakarams and a 5 tiered rajagopuram. The Tirumanjana Mandapam, the tirumamani mandapam and the Kannadi Mandapam are of great beauty. There are shrines to Rama, Venugopala, Narasimhar, Varaha here. This temple boasts of a nadaswaram made of stone. This temple is regarded as the Budhastalam (mercury) and being the ninth Divyadesam in the Tirunelveli area, it is regarded as Parama padam itself. Festivals: The asterism of each Alwar is celebrated here, as in Srirangam. Garuda Sevai in the tamil month of Vaikasi (Vishaka asterism - the birthday of Nammalwar) witnesses the grand Garuda Sevai, where festival images from all of the nine Nava Tirupatis congregate here. Nammalwar is mounted on the Hamsavahanam. The Paasurams on each of these deities are recited then, during this grand festival. 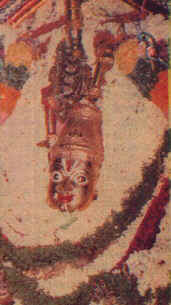 The image above is that of Perumaal from Tirupperai.